Long nights and changeable weather mean one needs to find other ways to pass the evenings at this time of year. For myself and my significant other, one of those ways is to play Monopoly. 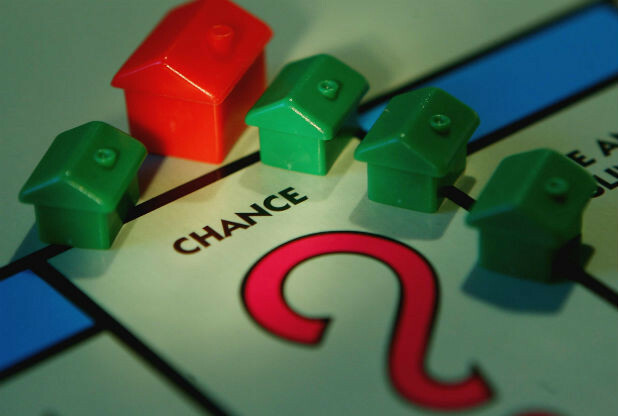 The game, based on the buying and renting of property, is like a busman's holiday for me. Interestingly, the game was invented in 1903 and was initially called The Landlord's Game. It wasn't until 1935 that the game gained its now-famous title. Property prices in Leicester in the 80 years since Monopoly was coined have certainly changed. Substituting the original street names for a selection from Leicester, here's a fun guide to the cost of properties today and in 1935. Initially, I focused on the LE3 postcode only, looking at the Brown Squares on the board, the "new" Old Kent Road in Leicester today would be Blackmore Drive, with an average value £51,200 (per property) and Whitechapel Road would be Pilkington Road, which would be worth £67,600. But what about the posh dark blue squares of Park Lane and Mayfair? Again, looking at LE3, Park Lane would be Forest House Lane at £366,000 and Mayfair would be Fairefield Crescent at £381,400. However, look a little further afield from the LE3 postcode, and such roads as Knighton Rise would claim the Mayfair card at £832,800. Also, I can't forget the train stations (my favourite squares) and, over the past 12 months, the average price that property within a quarter mile of the station sold for was £91,800. So, what you would have had to have paid for a property in Leicester back in 1935, when the game originally came out? The average Leicester detached house today is worth £303,240. Back then, it would have set you back £548 and 13 shillings. The average Leicester semi detached house today is worth £173,050. In 1935, you would have needed £313, 1 shilling and 11p. The average Leicester terraced / town house today is worth £137,310. Eight years ago, the price was £248, 8 shillings and 8p. The average Leicester apartment today is worth £123,550, compared to £223, 10 shillings 9p back in the day. I hope you enjoyed this bit of fun, but underlying all this is one important fact. Property investing is a long game, which has seen impressive rises over the past 80 years. In previous articles I have talked about what is happening on a month-by-month or year-by-year basis, but if you're going to invest in the Leicester property market, you should consider it a medium to long-term investment, because buy-to-let is pretty much what it sounds like – you buy a property in order to rent it out to tenants. As I reminded a soon-to-be first-time landlord from Littleover recently, buy to let is very different from owning your own home. When you become a landlord, you are essentially running a small business – one with legal responsibilities. On that note, I want to remind landlords of changes in legislation. The law has changed with regard to tenant deposits, carbon monoxide detectors and landlords' responsibility for immigration checks on tenants. Failure to adhere to these changes could lead to fines or, in some cases, prison. The Leicester Property Blog features buying advice and advice for potential and current landlords.